on September 22, 2015 at 7:37 pm By the Numbers: America's Unfortunate Fiscal Evolution from Madisonian Constitutionalism to Wilsonian Statism | 247newsonline.com provides 1000s of articles and information for dozens of topics. “A government that grows/spends more than its private sector cannot by any stretch of the imagination be a Republic; it is something much more sinister and oppressive.” –Doktor Thomas’ re-iteration of the blatantly obvious often confounded as appearing forgotten, invisible or unimportant, especially to pro(re)gressives. PS. The US fed.gov hasn’t been a republic for 100 years plus. If we grow government business will grow even more. Wrong, a very simple measure already exists. It is the % of Gov spending vs GDP. It that measure goes up, it means gov is expanding faster than the economy. Right now under Obama it is grossly and historically bloated, at the highest level since WW2, at 24%. Under Bush it was a more healthy 20%, and under Clinton it was at a very healthy 18%. It should also be noted that when it was at 18% we had both a healthy economy and a balanced budget. Romney proposed in his campaign to cut spending enough to bring it back to a healthier 20% in 4 yrs, but he lost. Now Obama is increasing taxes, with zippo in spending cuts, in the final fiscal cliff deal, and promisses more spending hikes to come. We were foolish enough to elect Obama, he will do nothing but spend, and when we follow Greece, the dems will probably still be blaming Bush. Government must decrease that the productive may increase. 15 years after I left, people at my company still quote Mason’s Rule: All problems are caused by solutions. Awesome and profound! Wisdom is not just knowing what is right, but communicating it in an efficient way that everyone can understand. Bypassing your rule leads to fiscal corruption, bankruptcy and a dictatorship. Greece and Spain are losing their sovereignty to Germany, because they need someone to fund their unrestrained appetite. The United States is slowly losing their sovereignty to China. on April 26, 2012 at 2:48 pm Switzerland’s "Debt Brake" Is a Role Model for Spending Control and Fiscal Restraint | Complete Debt Relief - Info and tips on debt relief and cutting credit cards! on April 26, 2012 at 9:08 am Switzerland’s "Debt Brake" Is a Role Model for Spending Control and Fiscal … | Compare Loans Guide - tips and advice on comparing loans easy! In the long run, this rule leads to the complete elimination of government. Is that your goal? Hmmmm…If taxes were tied to GDP then it would be in the interest of tax spenders (politicians) to facilitate an increase which would expand their power and influence while at the same time creating an environment conducive to business and entrepreneurship. WOW! That was easy. I think the “golden rule” is incorrect – in that the word “should” should be replaced with “must”, since the government produces nothing and “must” depend on the private sector for support. There is already a proposed constitutional amendment already out there to impliment your rule. It requires that fed gov spending can never exceed 19% of GDP. Mitchell’s Golden Rule could be taken as a fundamental law of _prescriptive_ politics. 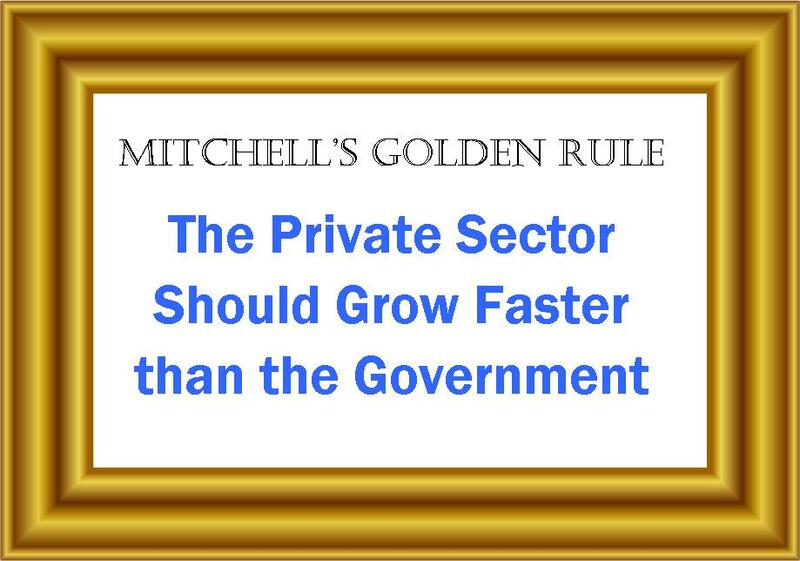 In the long term, the government always grows faster than the private sector. The exceptions are state collapses due to revolution or foreign conquest. This law was actually discovered by Ibn Khaldun (if not earlier) which means that it applied to early Islamic states. It seems that it also applied to the Roman Empire, to most if not all Chinese dynasties, and to the European Renaissance states. Unfortunately, so far there has been no American exceptionalism in this law. “Business Must Grow Faster Than Government” would have more punch. Back when Kennedy took office and signed an EO permitting govt workers to unionize, 1 person in 19 worked in the public sector. For five decades the left has been growing the public sector (at the expense of all the productive sectors) as fast as it can (the better to offer cushy jobs to their loyal foot soldiers) to the point that we now have 22 million govt workers and 8 million in public education out of a total workforce of 150 million (although that’s been slipping since the Congress went Dem in 07). The problem is that all jobs are not the same. All pay taxes, but jobs in the public sector get their salaries, taxes and benefits covered by tax revenue–they are tax consumers. Ultimately, workers in the private sector are the only true taxpayers–they have to earn a salary to pay the taxes to pay the salary to pay the income, property, sales and other taxes of a public worker. Back then, we needed the taxes of 2 earners to cover the public employee. That left 16 out of 19 taxpayers to pay for everything else–Social Security, schools and libraries, satellites, highways and so on. That’s sustainable. Now it’s down to 1 in 5, but public salaries and especially pensions are way up. Now it take 3 earners to cover the non-earner. That leaves 1 taxpayer in 5 to cover everything else, and it simply cannot be done. That explains how and why the Dems have saddled us with this enormous debt while feeding us the fictions that the size of government is nothing more than a matter of taste and that a job in the public sector helps the economy rather than burdens it. It also means any attempt to rev up the economy before this enormous structural problem begins to be dealt with is doomed. What we must do in reasonably short order is shift 20-million jobs from the public to the private sector while also keeping taxes low and slashing regulatory oversight in order to rev up the economy to cover those jobs plus another 10+ million to take care of the current un- and under-employed. Can you say “privatize”? “Deregulate”? “Tax reduction”? “Drill, baby, drill”? As Marco Rubio proclaims, what we need is more taxpayers… more *true* taxpayers, that is–earners in the private sector. Privatize ’em. Cut ’em. Whatever it takes. But we cannot run a $3.8B govt budget on top of $11.2B in private-sector earnings–it’s like asking a juggler to put down his clubs and toss anvils instead. Replace “should” with “must”. “Should” is a suggestion with little or no force. How many other Laws reference “should”? “One should not commit murder” vs. One must not commit murder”. The late economist Milton Friedman pointed out a golden law of taxation. The real, current tax burden is government spending. Government borrowing (delayed taxes) is merely finance. Government spending directs current, real resources into wasteful projects, and denies a flow of resources to businesses which would like to produce more value than they consume (create a profit). You might’ve figured that your English professor friend would want to critique your language, right? So, change “should” to “must.” To me, “should” makes it sound like a matter of persuasion, almost as if you believe it to be a matter of morality. “Must,” OTOH, implies a matter of fate, or cause and effect. You should be nice to everyone. You must be nice to your boss.You should point the hose away from your face. You must pun the gun away from your face. But then again, it’s your rule. Might as well label it Mitchell’s Golden Whisltling in the Dark. Now with the fundamentals better defined, can I build on it by deriving “Zorba’s Voter Suicide Index”? “Zorba’s Voter Suicide Index” = The percentage of voters who believe that bypassing Mitchell’s Golden Rule is a shortcut to prosperity. Since you’ve already identified which of the two is “productive”…the goal should be to completely *eliminate* the unproductive. No reason to continue to squander resources. Too many problems that need to be solved productively. Good in principle, but the problem is that these things are difficult to measure. I would allow for a further refinement of your rule. . .